GREAT-grandmother Eileen Galligan has carried 15 children in her lifetime but now her 87-year-old legs are having trouble carrying anything else. “They don’t want to carry me,” Mrs Galligan said. The long-time Booval parishioner is one of nearly 20 seniors attending a free fitness class helping the former farmer get back on her feet. The classes are held every Friday at her parish, where she has attended Mass regularly for more than 50 years. Mrs Galligan joins her youngest daughter for a gentle, one-hour fitness class, which she calls “heaven” on earth. The classes are offered by Centacare South West Community Services in partnership with the Booval parish, Rotary Club of Ipswich North, Lions Club Goodna and a local exercise physiology business. “I came to these exercise classes because I needed help to get my legs working, and everything working again,” Mrs Galligan said. The classes, which are followed by a free lunch, also do more than just help senior citizens like Mrs Galligan increase their mobility. The regular group of 18 seniors have also found the classes help combat two deadly diseases claiming the lives of hundreds of older Australians – isolation and loneliness. 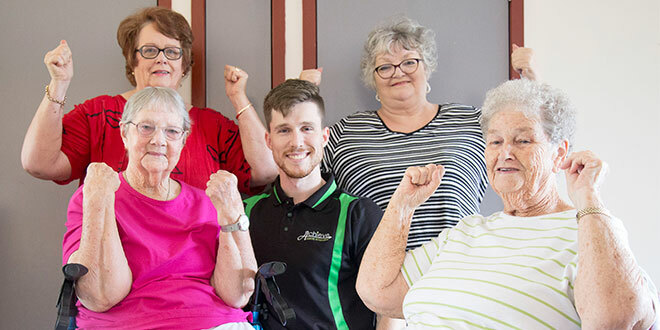 Achieve exercise physiologist Damien Johnson, who leads the Booval fitness classes, said isolation could cause more issues for senior citizens with physical or mental illnesses. “We see a lot of people with post-traumatic stress disorder, depression, psychological disorders, and there is a massive link between that and exercise,” Mr Johnson said. “People coming here, if they feel socially isolated, this is a great way for them to come and see people that might be in similar conditions, facing similar challenges, and realising you don’t need to face this stuff alone. “A lot of the individuals here they might be living on their own, they don’t feel like they have enough of a connection, and that can cause more issues for their conditions. “If they’re suffering depression or something like that, being isolated is definitely not going to be helping. Booval parish priest Fr Jojimon Thomas, of the Missionary Congregation of the Blessed Sacrament, said it was important for the Church to care for its senior citizens, as outlined by a social justice statement released by the Australian Catholic Bishops Conference last year. As well as being able to provide for the parishioners’ spiritual needs through the sacraments, Fr Thomas said social activities also improved their souls. It also offered the Church a way to reach the people. “All the time people are coming to the Church only for the Mass, but now the Church is going to them and mingling with them, talking to them,” Fr Thomas said. Centacare South West service delivery manager Kamal Jayawardene said the fitness classes were a great success, with potential to run two classes concurrently due to high interest. Mr Jayawardene said Centacare’s goal was to support people, and a fitness program offered a way to prevent serious injuries among senior citizens. “We are helping them to stay healthy and maintain their fitness,” he said. “We only expected ten, twelve and immediately we got a very good response. “We started with fifteen and now average about sixteen to eighteen. To register for the exercise classes, contact Centacare on 1300 236 822 or on (07) 3362 8700.